Simple to make – and unlike anything you’ve had before! Belle Isle Cress (round leaves) and Pepper Cress (frilly leaves). These cress plants are beautiful to look at, and they both have an ultra-radish flavor. The Pepper Cress has a fruity sweet taste at first, then takes your breath away. 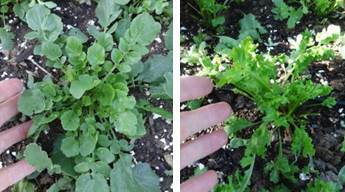 The Belle Isle Cress is a bit more savory, and even stronger in its radish flavor. I like to eat these plain, pinching them off the plant. But since they are strong, I came up with a simple but delicious salad dressing that tames this potent flavor into a super dressing for all our other exotic lettuces. Puree the cress – I use an immersion mixer, but if you are making a bigger batch, you can use a blender or larger device. Add all the other ingredients. I use about 1.5 sour cream to 1 mayonnaise – adjust to your preference. Anchovy paste adds a great umami to the dressing. You won’t know it’s anchovy – trust me!